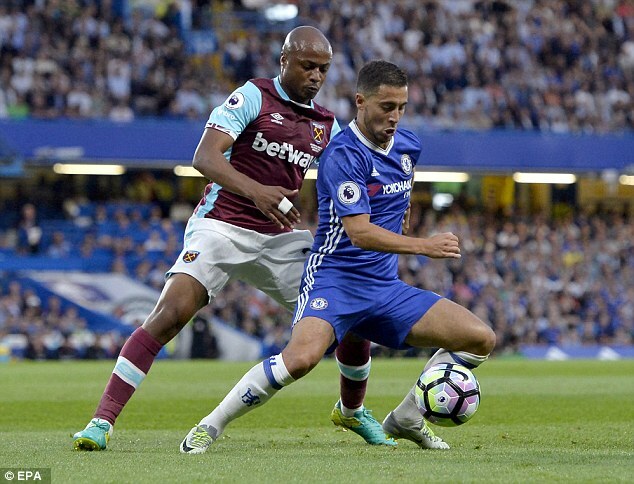 The £20.5million forward limped off the Stamford Bridge pitch 35 minutes into his debut against Chelsea with a thigh injury which manager Slaven Bilic hoped would only keep him out for three weeks. 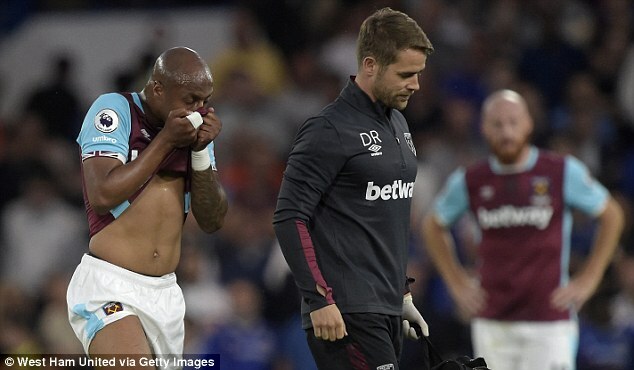 But scans on Wednesday revealed that Ayew, signed from Swansea 10 days ago, will require surgery that will keep him out until at least Christmas. Ayew pulled up after sprinting for a ball and was not expected to be out long-term. 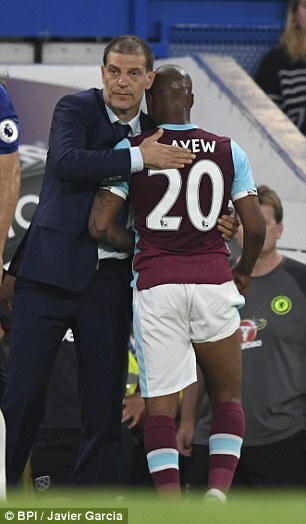 Just hours before the results of the scan arrived, Bilic was explaining how satisfied he was with the size of his squad, but the Croatian has been left devastated by the news that Ayew has torn a muscle. 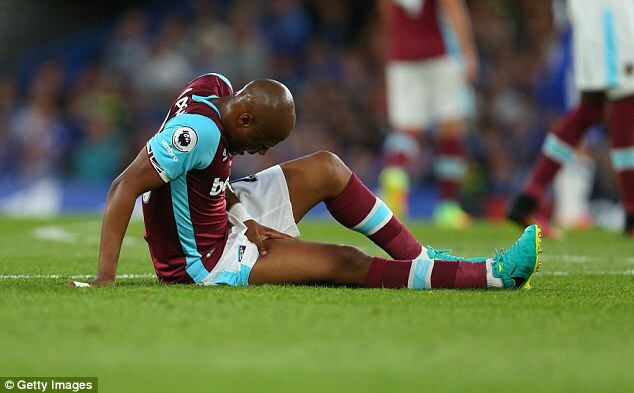 Club doctor Stijn Vandenbroucke said Ayew faced ‘a significant rehabilitation period’ and added that they would be consulting ‘top specialists’ to deal with the problem. Bilic is already feeling the effects of the stresses and strains of competing in the Europa League and on a domestic front. Their Monday night Premier League match against Chelsea was followed by a flight to Romania to face Astra Giurgiu two days later to prepare for the Europa League qualifier on Thursday. Goalkeeper Adrian took a nasty kick to the shin by Diego Costa and only returned to training on Wednesday. No 2 Darren Randolph will start in goal. Dimitri Payet came off the bench against Chelsea but has been left at home to continue his return to full fitness, having reached the Euro 2016 final with France. They have added to long-term absentees Aaron Cresswell, out for another three months with a knee injury, and Manuel Lanzini, although he is expected back from his knee problem in a week. Striker Jonathan Calleri, who competed in the Olympics for Argentina, completed a season-long loan this week from Deportivo Maldonado, has trained with his team-mates and is set to play some part. ‘Man City played Saturday and Tuesday, we played Monday and Thursday, it’s the same. ‘I know that Man City players for the whole of their careers they get used to playing in midweek in the Champions League for Valencia, Manchester City, Lazio, whoever. ‘We didn’t. But we wanted to and we want to give it a go. It’s not just me who wants to try to breed that mentality into West Ham, it’s everybody. West Ham fell short at this stage and against the same club last year, but their opponents, the Romanian champions, are without head coach Marius Sumudica who is banned from all football activities for two months due to betting breaches.